I left the Steens Mountain Resort at 0530 and headed back to the Overlook Rim hoping to be able to catch a sunrise across the Alvord Desert – looking up I could see a blanket of stars so my hopes were high. However as I drove toward to the viewpoint the weather got progressively worse – clouds, wind and cold almost as bad as the night before. I am not a quick learner but I did manage to convince myself to stay in the car. Driving back down the road accompanied by bands of hunters who were also out and about looking for a different subject to shoot I decided to stop in an aspen stand at Jackman Park and found this group of lovely graceful dancers shaped by the wind and the snow over the years. They remind me of a boojum tree but of course a different species in a different location. Breakfast at the Frenchglen Inn was a welcome treat – coffee and french toast – humm! 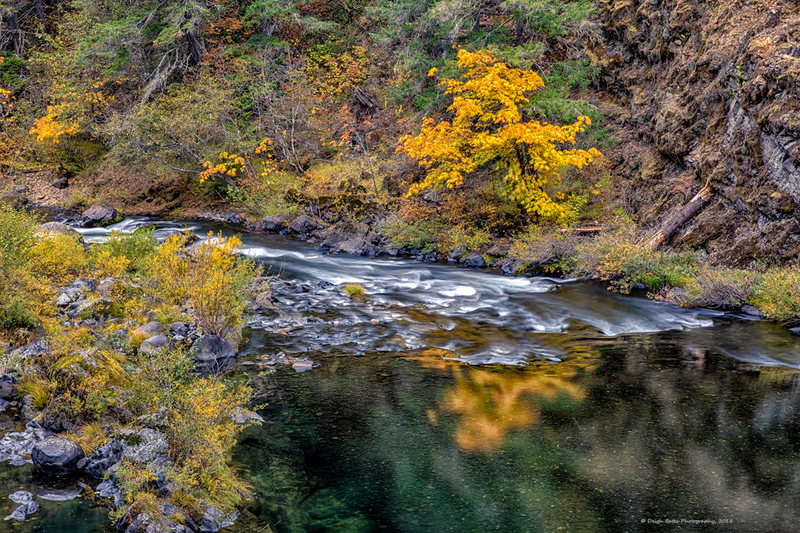 I drove south hoping to find color along the Blitzen River on the south end of the Steens Mountain Loupe road. 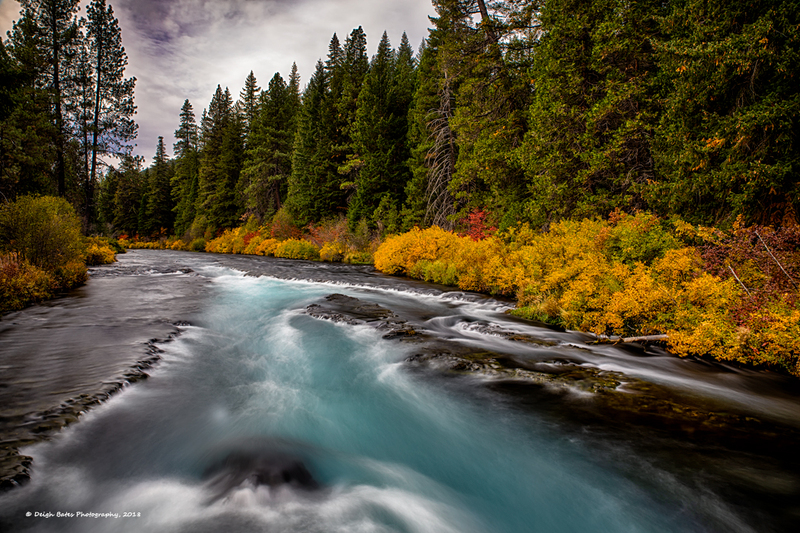 It was not until I got high that I started to pick up any color and was glad the morning storm had cleared. . The image below is of Big Indian Gorge. I had to laugh when I read the above – seems like Thoreau figured out The Magic Hour well before photographers of the modern bent. His observation still works today and I think applies to the seasonal changes in color as well except over a longer period of time. 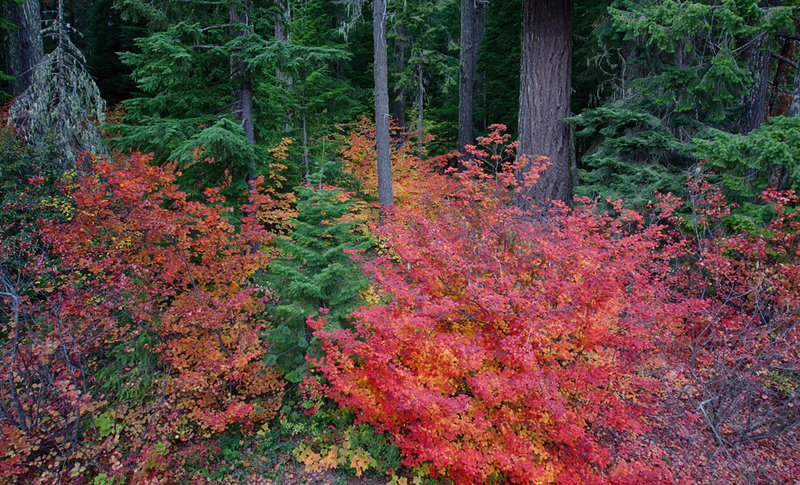 As I headed out early Tuesday morning the drive up the Mckenzie Pass Highway was spectacular – the color is just blazing and seemed to get better toward the junction with Highway 20. 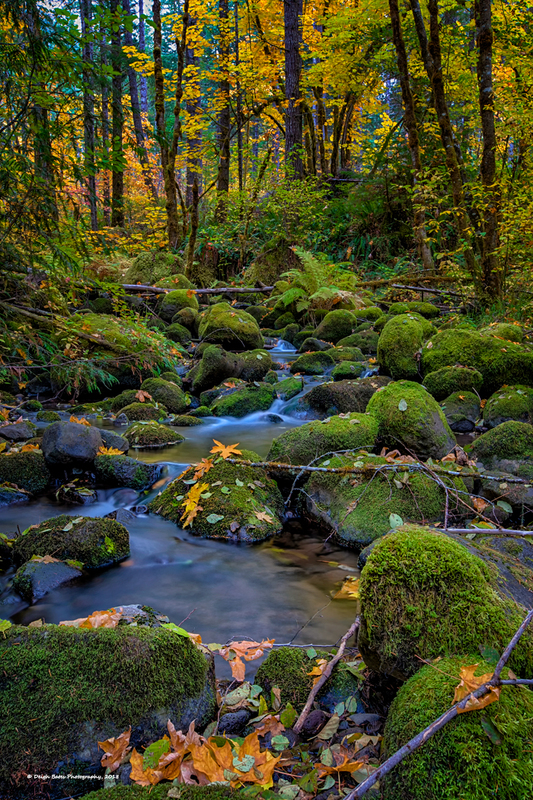 I stopped at a location that I was sure held some great color – excited to be shooting it. As I framed an image with my wide angle lens and pushed the button I got a message on the LCD screen saying there was a contact error and I needed to clean the lens contacts. I did that (sort of) and managed to get a few images before the message showed up again. ARGGGH!! It was a portent of things to come. Driving across the High Desert of Oregon is always a treat for me – classical music on the car stereo and almost no traffic save for another Subaru that hung with me all the way into Burns. The open views are just spirit filling for me and with the beginnings of a weather front moving in it was very interesting. 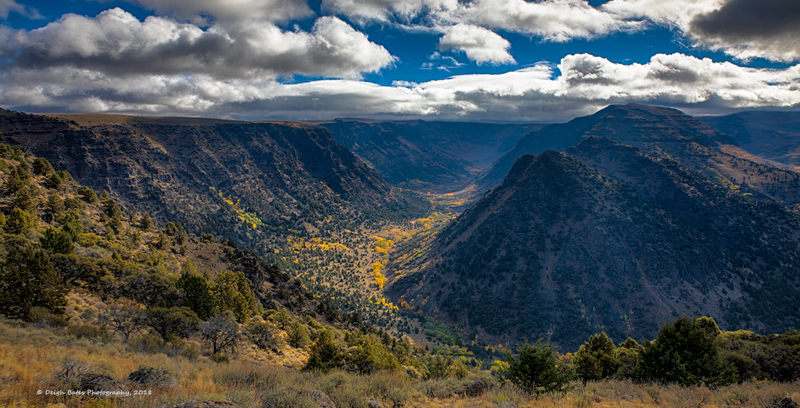 I planned to spend the night at the Steens Mountain Resort – a rather rustic set of trailers and campsites on the hill above the Blitzen River. Nothing fancy but it met my needs. 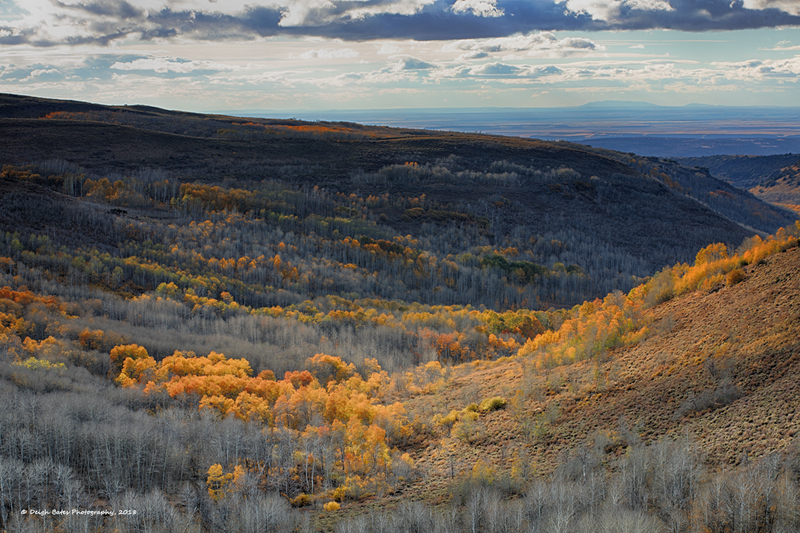 Headed up the Steens Mountain loupe road hopefully to photograph autumn color and a sunset. Prior to what I knew would be a good sunset location I went up to the Kiger Gorge overlook. I noticed the wind picking up all afternoon and it was brutal when I got to the overlook. Fighting the wind I went down to canyon edge and did manage to get the shot below despite some further camera issues. 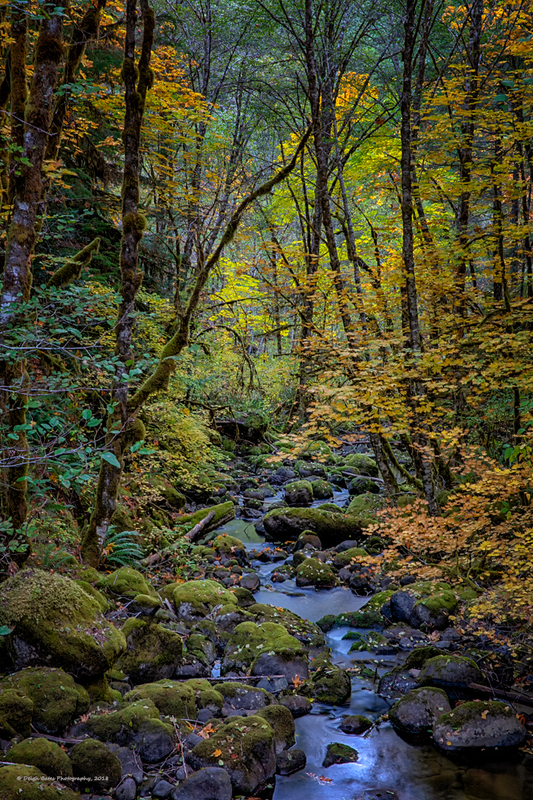 The color in the Gorge was great and I think added some interest to the image. What a magic place but the wind…. 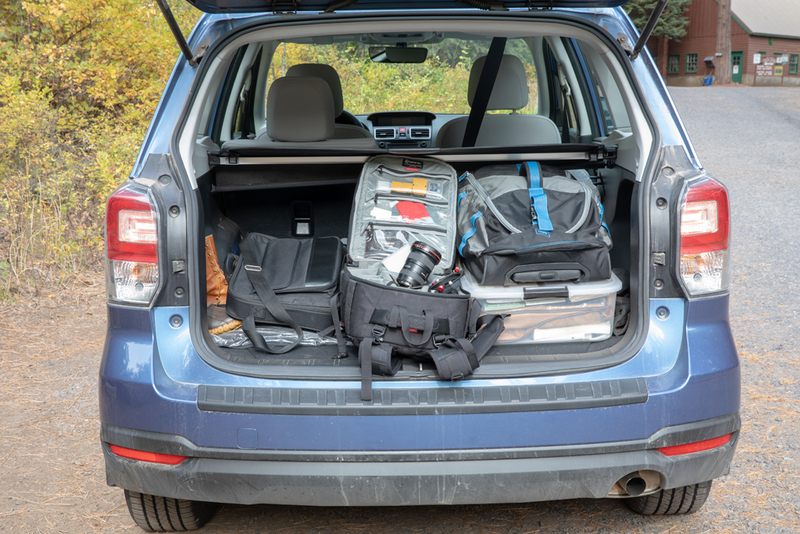 Next I went up to the Rim Overlook – not a good plan – the wind at the top – near 9,800 feet was extreme and even tho I parked so that the car offered some protection the minute I walked around the side of the car to get the camera out of the back I got swept off my feet. Probably a combination of clumsiness and wind. Took me by surprise. Impossible to shoot – just not safe. Went back down to my planned sunset location. There was not much left for color and the storm rather blew out sunset conditions. 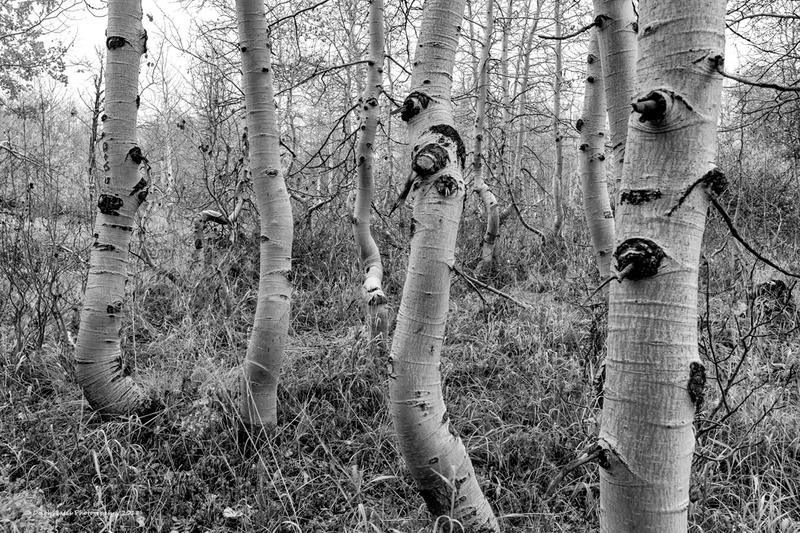 You will notice the lack of colorful aspens in most of the Fish Creek gorge but I think there was still some interest left to photograph. Perhaps wishful thinking on my part and you may disagree. I went back up on the mountain the next morning but conditions were even worse – still windy and very cold – so headed back to Frenchglen for breakfast. Next post will be from that day. Please click on the images for a large screen view and as always I welcome your comments – good or bad.